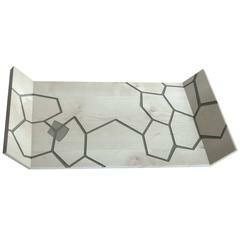 Squared black Marquina marble tray, ideal for spa, in the bathroom but also as a table centrepiece or in the entrance as a dresser valet. 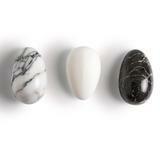 Each piece is in a way unique (since each marble block is different in veins and shades) and handcrafted in Italy. Slight variations in shape, color and size are to be considered a guarantee of an handcrafted creation. This object gives a distinct touch to your house, spa and can be used in the kitchen, on the table or near the bathroom sink. The history of the Vanelli family’s marble began in 1818 when the Duchess Maria Beatrice d’Este granted the Vanelli family the right to excavate Carrara’s white marble. Since the nineteenth century, Vanelli quarries provided marble for building public works in the most important European capitals. In 1960, Aldo Vanelli acquired the family quarry called Zona 67. Today, with the advent of robotics, it is possible to realise complex art works and special projects. Fiammetta Vanelli is the successor of this extraordinary heritage, a woman entrepreneur who wanted to model the solid soul of a stone into soft and cozy shapes with a feminine sensitivity. Raw materials like Portoro, Bardiglio, Paonazzo, Statuario marble are extracted directly from the family quarries. Under the brand FiammettaV, her objects combine the thousand-year old Italian artisan tradition with the most advanced technologies and each creation is a unique piece. You can find FiammettaV creations in the most prestigious stores, among them: Flair, Luisa Via Roma, Rossana Orlandi – Italy; Conran Shop, Fortnum & Mason, Harrods, Heal's, Selfridges – London; Bergdorf Goodman - New York. 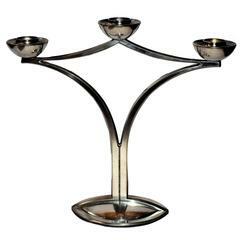 Elegant and sophisticated modernist candelabra dating to the 1930s and originating from France. This candelabra would make a wonderful centerpiece to a dining setting or sideboard.